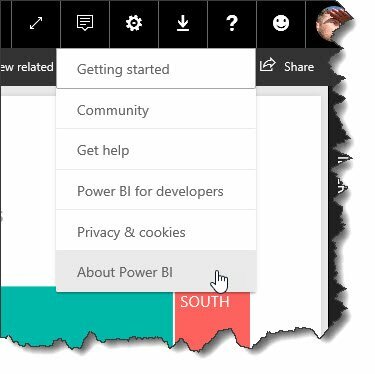 You needn’t be – it’s clearly shown if you go into “About Power BI” through the “?” question mark on top right ribbon. That’s it! So in our case, our organisation in the UK has it’s data in Microsoft’s North Europe (Ireland) datacentre – nowhere else, nothing in the USA etc… so you just need to ensure compliance of GDPR and other security and privacy policies for that location. They have a very recent update and good documentation at docs.microsoft.com/en-us/power-bi/service-admin-power-bi-security. Of course, this may become slightly awkward after any Brexit, but you can be sure Microsoft will be quick to move their datacentres to the UK if necessary to maintain one of their best customer countries for cloud provision. 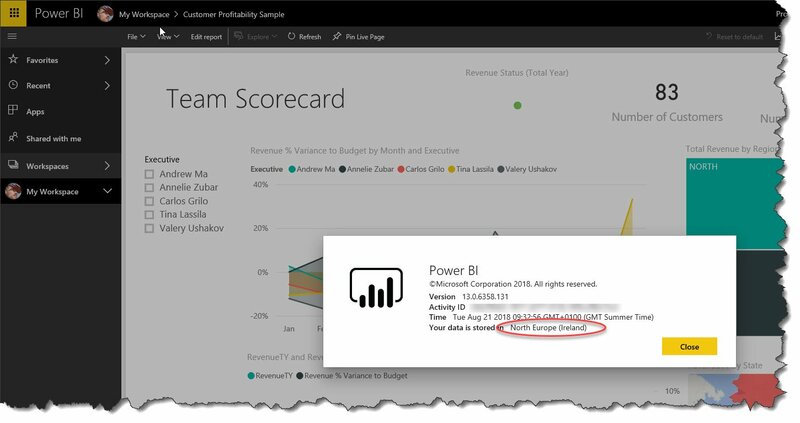 And if you need to pull out, just delete the datasets and reports and even close your account (see that link for data retention too) – you’ll still be able to use local PowerBI Desktop and even publish to your own SQL Server using SSRS if necessary. So, what’s stopping you? 🙂 Drop us a line if you want to set things up.